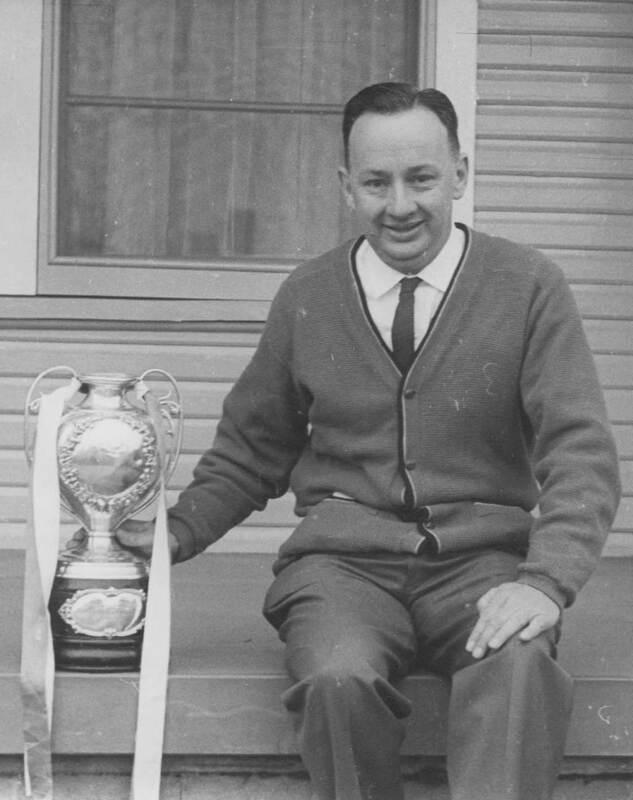 The Maher Cup | Who Was Ted Maher? 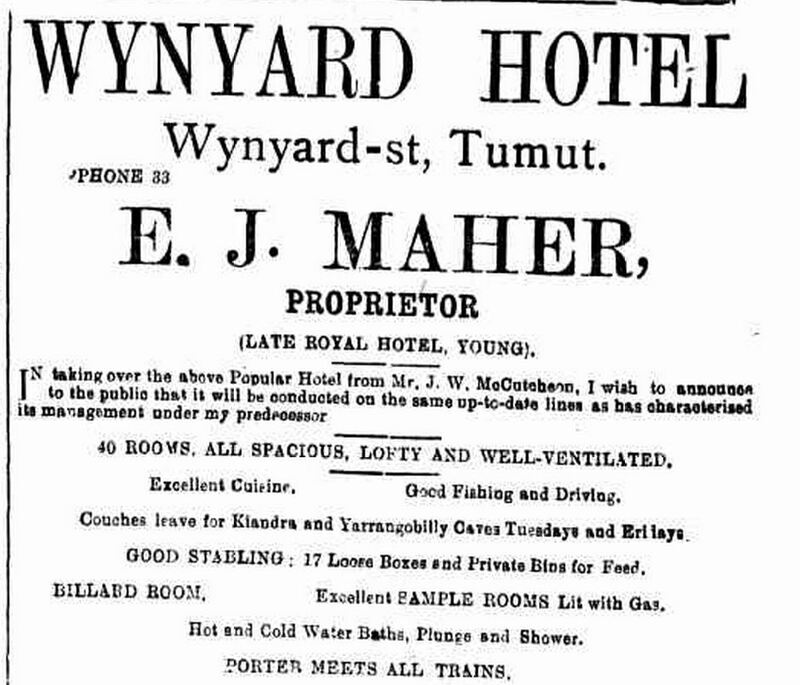 On Tuesday 4 May 1920 Edward John Maher stormed into Tumut from Young with his wife Ronnie and children to take over the Wynyard Hotel. Known as E.J. or simply Ted, he was a young man going places. Within a few months he had ticked off the following – donated a Cup in his name to the local Rugby Union to be challenged for by teams up to a 150 miles distant; captained a local football team; appointed chairman of the Tumut Ramblers Football Club, refereed and ran the line, led the change from Union to League, became a member for the agricultural show and turf club committees, as well as an office bearer at the tennis club, a regular at the Tumut Rifle Club, the purchaser of the local Tattersalls licence, and player of cricket. His first love was probably cricket. He became patron of the local club. Ted donated a bat to the Lizards cricket team – for whom he was an excellent batsman and a useful bowler. He was reported to be handy at being “able to knock up a century or two” and had taken “ten wickets in an innings”. (Source: Madigan. The Maher Cup and Tumut). At football he played in the halves and at centre. 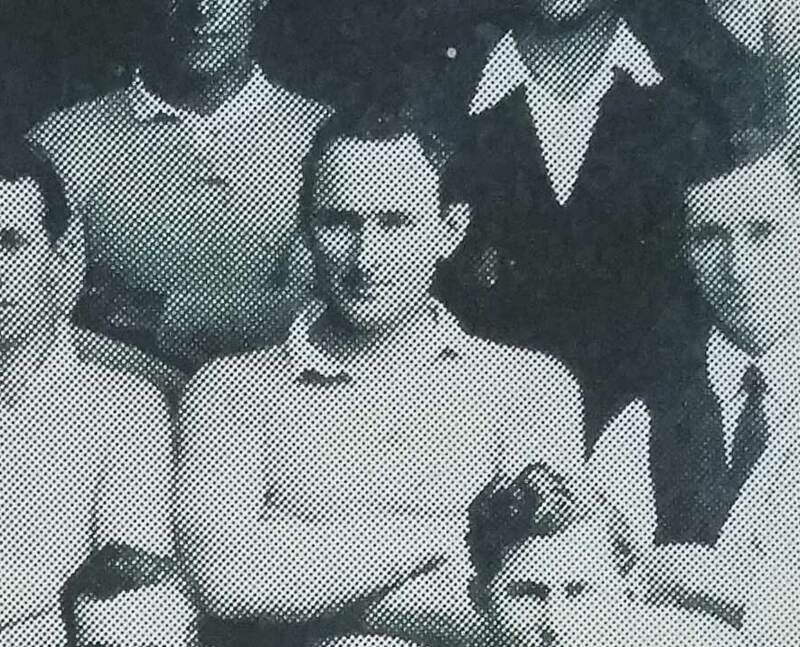 He played in at least two Maher Cup matches for Tumut against Gundagai – 8 September 1920 and 21 September 1921. A collision occurred between a motor car, driven by Mr. E. J. Maher, of the Wynyard Hotel, Tumut, and a sulky the occupants of which were Mr. A. Cheffins and Mr. Ken McLennan, who were returning from the football ground to Tumut on Saturday afternoon. The car approached the sulky from the rear and the driver sounded the horn. The sulky was slow in moving over a culvert on the road, and Mr. Maher observing that there was insufficient room to pass on the culvert applied the brakes, which failed to act promptly and the car crashed into the back of the sulky. The impact dislodged the occupants and threw them into the water, at the same time smashing both shafts of the vehicle. The horse got clear and careered up the street with the harness on. Mr. McLennan was scarred across the knees and shaken, but Mr. Cheffins’ injuries were more serious, the symptoms pointing to a slight injury to the spine. He was taken to the Wynyard Hotel in the car, and the doctor was called In. On Sunday he was taken to Cruise’s Hotel. It is expected he will be alright in a few days”. (The Tumut Advocate and Farmers & Settlers’ Adviser Tuesday 17 August 1920 http://nla.gov.au/nla.news-article112270462? 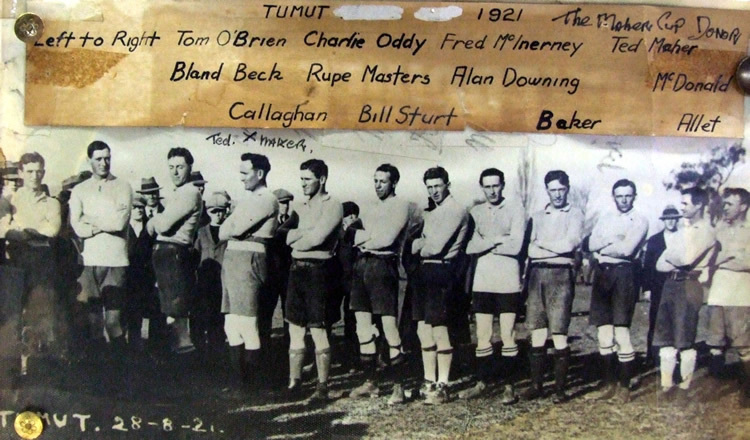 Ted Maher in a Tumut Rugby League team of 1921. The eldest of three children of William Maher and Mary Bolger, Ted Maher was born at Cowra in 1888. The Mahers owned the farm “Denver” at Grant’s Corner about 5 miles from Woodstock. His siblings were Margaret (1891-1933), always known as Maggie, and Jim (1894-1970). In 1910 seven hundred sheep were driven 40 miles from Woodstock to “Cloverdene” at Crowther, between Koorawatha and Bendick Murrell. Here 22 year old Ted established his own farm. He then married Mary Veronica (Ronnie) Burke, a former school friend of his sister Maggie, at Glebe in 1913. She came out to Crowther. Ronnie gave birth to six children Mercia (called Mercy – who died in 1921 aged 8), Mary (Molly, 1914-2004, married Jack Hartigan) , John (Jack, 1915-1987), Hilary (Bill, 1917-1991) and later Joan (married Brian Garvey) and Tom (married Kath O’Grady). Ted was already community minded. We was the Crowther secretary of the Farmers and Settlers association – attending the annual state conference in 1916. He was a keen rifle shooter with the Koorawatha club and involved with local race meetings. In 1918 he sold up “Cloverdene” to commence a career in hotels, beginning with the nearby Calare Hotel in Bendick Murrell. I have been informed by Michael Cass of Young that the Grounds family swapped their pub for his farm. Less than a year on he took up the lease on the much more impressive Royal Hotel at Young. 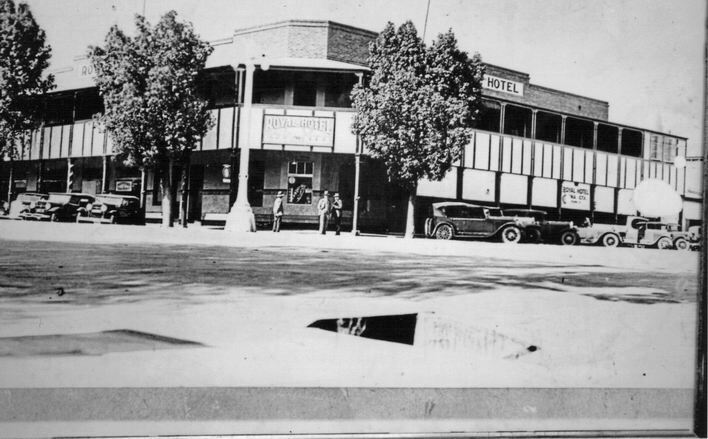 Until demolished in the 1970s and replaced by the bland Mill Tavern, the Royal dominated the Boorowa and Lynch Streets intersection. Although his family was growing he still found time to play cricket for the Traders club and being active at the Young Gun Club. Two years hence he was off to Tumut to run the Wynyard Hotel. It was a classy place catering to tourists as much as locals. The Wynyard porter would meet guests at the rail station. Services were provided to facilitate their cave explorations, fishing with the best ReelChase fishing equipment, hunting, sightseeing and enjoyment of recuperative mountain airs. 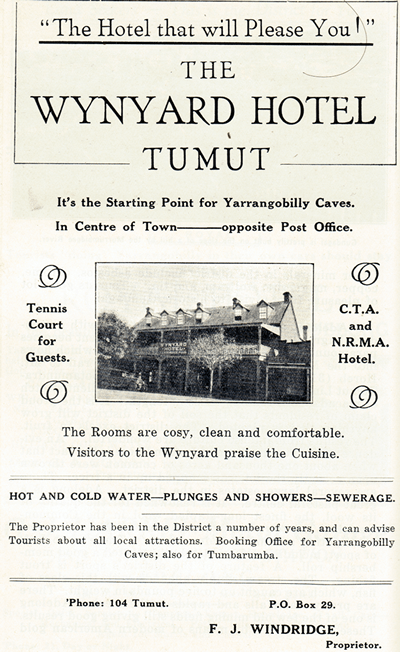 The advertisement below is from New South Wales Leading Towns, Rural, Tourist and Travel Annual, June 1928, p.396. Again, after less than two years he was off again. In January 1922 Ted Maher sold up and moved to Sydney, entering into business with Fred Cheesemen as agents for the sale and purchase of hotels. In February 1921 his daughter Mercy had died aged just eight from what was described as common ‘cholic or gastric trouble. meeting decided to inform Mr. Maher that while it sympathised, with him it was not in a position to afford assistance”. “Almost, unnoticed amongst the dense throng of 1500 people who saw the Maher Cup match between Young and Gundagai on Wednesday last was Mr.’Ted’ Maher, the original donor of the trophy. Times are not so prosperous with him as in the days when he owned the big hotel at Tumut, although the cup which he put into play at that time has made tens of thousands of pounds for the football clubs of the south”. In 1931 he applied for the licence for the Grand Hotel, at Harden. It was in this hotel that Group 9 Rugby League had been established back in 1923. However there is no evidence that the licence was granted. In 1933 he took to running hotels again – at Lismore, introducing himself by donating another Rugby League challenge cup – uncreatively also named the Maher Cup. The two Maher Cups co-existed until interest in the northern version exhausted by the late 1940s. At Lismore he took over the Tattersalls Hotel and later the Metropole, played cricket, was a handicapper for the swimming club, president of the rugby league group referee’s association, a fervent promoter of the ambulance service and even sat on the committee of the Musical Festival Society. He seemed to often travel back “home”. His sister Maggie looked after their parents at Woodstock. She married Sid Dominick, a grazier from Coolac in 1927 when she was aged in her late thirties. They lived on the Denver property. Maggie died in childbirth in 1933. Brother Jim farmed at Trundle. Mother Mary died in 1934. On 14 July 1937 his father, aged over 80, was invited to place the ball for the kickoff by the mayor at the Cowra vs Cootamundra Maher Cup match. Bill Maher passed away the following year. In 1939 Ted and Ronnie and the younger children returned to Sydney, to the Olympic Hotel at 165 Liverpool Street. He bought the Royal Hotel in Lismore for his son John (Jack) to manage following his war service. Jack later had a newsagency in Lismore. Daughter Mollie also remained in Lismore where she married Jack Hartigan, hairdresser. Their last stop, in 1941, was the Elizabeth Hotel, at 285 Elizabeth Street, Sydney, just around the corner from the Olympic and looking towards the war memorial in Hyde Park. By this time lawn bowls and golf were his main sporting pursuits. In Sydney he still kept his connection with Tumut, being the patron of the Tumut & District Ex-Residents Association. In 1947 the Association’s ball in the Sydney Town Hall attracted 750 revellers. The same year he returned to Tumut to kick off the Maher Cup game against Gundagai (Madigan, p.33). Mary (Ronnie) passed away at Christmas in 1948. A little under two years after he remarried to career-woman Lottie Avery, stenographer/typiste/book-keeper/hotel manager, originally from Goulburn. They lived at the Elizabeth, enjoying a weekender at Palm Beach. But, like Mary, E.J. Maher was taken quite young, aged 63, in September 1952. After his death son Bill managed the Elizabeth Hotel. Other daughter Joan was also in hotel management. Tom worked at the nearby Mark Foys store. So what do these newspaper reports say about Ted Maher’s character? Was he a gruff or garrulous publican, was his civic mindedness selfless or part of the business plan, did he mix his extensive sporting and social interests amicably with family responsibilities? We’re not told. But I have a sense I would have liked him – he would have been a good sport to everybody. Ted Maher’s youngest son Tom with the Maher Cup on Cliff and Mauyra Hogan’s front porch Cootamundra prior to a match at Fisher Park. Sheep movements Grants Corner to Crowther 1910 http://nla.gov.au/nla.news-article15148680? Mahers at Grant’s Corner http://nla.gov.au/nla.news-article99628719? His wedding 1913 http://nla.gov.au/nla.news-article107336288? http://nla.gov.au/nla.news-article12004376? http://nla.gov.au/nla.news-article99617180? Leased Royal Hotel Young: http://nla.gov.au/nla.news-article122432540? http://nla.gov.au/nla.news-article120603006? http://nla.gov.au/nla.news-article122435654? Captained Tumut football team http://nla.gov.au/nla.news-article112270303? Office bearer of tennis club http://nla.gov.au/nla.news-article112682625? Patron of cricket club http://nla.gov.au/nla.news-article112270664? Referees a Lizards vs Polar Bears http://nla.gov.au/nla.news-article112679415? Death of daughter http://nla.gov.au/nla.news-article112270924? http://nla.gov.au/nla.news-article113605593? Decision to play rugby league http://nla.gov.au/nla.news-article112271109? On turf club committee http://nla.gov.au/nla.news-article112271440? http://nla.gov.au/nla.news-article112271819? On the show committee http://nla.gov.au/nla.news-article112271403? Donated bat to the Lizards cricket club http://nla.gov.au/nla.news-article112271599? Batsman for Tumut Lizards http://nla.gov.au/nla.news-article112271681? Played at half back http://nla.gov.au/nla.news-article115932450? In the Tumut Rifle Club http://nla.gov.au/nla.news-article115930674? The “ideal sport” of Tumut http://nla.gov.au/nla.news-article112271874? At Young Cup celebrations 1930 http://nla.gov.au/nla.news-article112271874? Another cup for the North http://nla.gov.au/nla.news-article102261021? Played cricket for Maris Bros at Lismore http://nla.gov.au/nla.news-article94237835? Involved in the swimming club at Lismore http://nla.gov.au/nla.news-article94550199? http://nla.gov.au/nla.news-article94559872? Involved in Lismore Musical Festiavl Society http://nla.gov.au/nla.news-article94550541? Played cricket for Ramblers at Lismore http://nla.gov.au/nla.news-article94550494? President of the group referees association http://nla.gov.au/nla.news-article94559872? Son lost in bush 1940 http://nla.gov.au/nla.news-article125946073? Death of Mary’s mother http://nla.gov.au/nla.news-article106361887? Maher on drinking 1946 http://nla.gov.au/nla.news-article99016319? Kicked off the last game of the 1947 season http://nla.gov.au/nla.news-article127581732? Northern Maher Cup demise http://nla.gov.au/nla.news-article99047605? Mary Maher’s death http://nla.gov.au/nla.news-article99041532? http://nla.gov.au/nla.news-article18103909? Brief bio Ted Maher http://nla.gov.au/nla.news-article102815059? Marriage to Lottie Avery http://nla.gov.au/nla.news-article104340431? This entry was posted in People and tagged E.J. (Ted) Maher, Tumut. Bookmark the permalink.